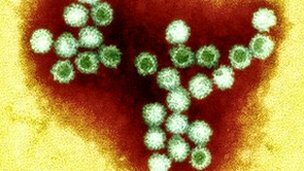 The Isle of Man’s director of health has urged anyone suffering from the symptoms of the winter vomiting bug, Norovirus, to “stay at home”. The department of health has recorded an increase in reported cases of diarrhoea and vomiting, which are the main symptoms. In 2011, a ward at Noble’s hospital was closed to admissions after an outbreak. The previous year two wards were closed due to the virus at the Ramsey and District Cottage Hospital. Over the past fortnight there have been 53 outbreaks of the virus in the UK, leading to numerous ward closures. Dr Kishore said: “It is extremely important that people with the bug stay away from hospital wards, schools and care homes to help prevent the spread of the virus. It is best to stay at home”. The bug lasts between 24 and 48 hours and patients are advised to drink lots of water and eat easily-digestible food. Even after the symptoms have passed, patients remain infectious for 48 hours, so those suffering are reminded to remain off work during this time. The department of health has issued advice to people to prevent the spread of infection. These include avoiding hospitals or old people’s homes and washing hands thoroughly , especially after using the toilet and preparing food. What is winter vomiting disease? Winter vomiting disease is caused by the small round structured virus (SRSV), also known as the Norwalk-like virus or Norovirus. Norovirus lives in the gut and is passed from person to person by poor hygiene after using the bathroom – not washing hands properly after using the toilet and then touching toilet handles, seats, door handles and so on. It can also be spread when someone vomits and small aerosols containing the virus enter the air. ‹ Rough day in Port St. Mary!